BREXIT official envelope issued by the Philatelic Shop - European Parliament Strasbourg. PE699T1 : HISTORICAL DOCUMENT OF THE BREXIT! "EU REFERENDUM 23 June 2016 - Remain or Leave? 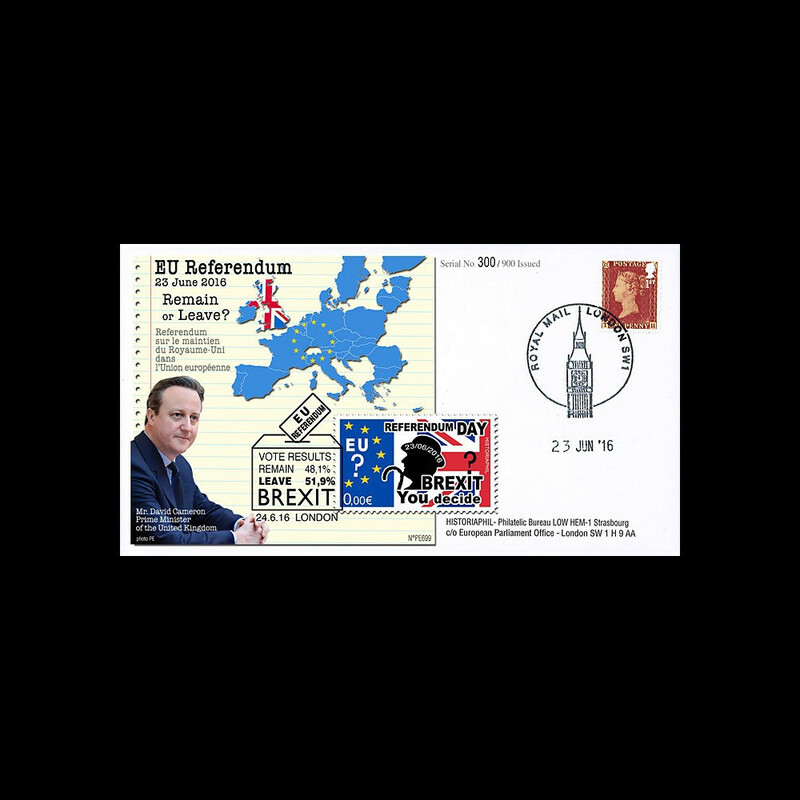 Mr David Cameron, Prime Minister of the United Kingdom"
Franked (TYPE1) United Kingdom 1 value 1st Class "175th anniversary of PENNY RED 1841-2016"
+ special label 0,00€ "23/06/2016 Referendum DAY - BREXIT You decide"
Cancelled BLACK cachet London "EU Referendum Vote results : Remain 48,1% and LEAVE 51,9% - BREXIT" June 24, 2016. PE699-FD : 23.06.2016 - Labels sheetlet "EU Referendum vote in United Kingdom - BREXIT"